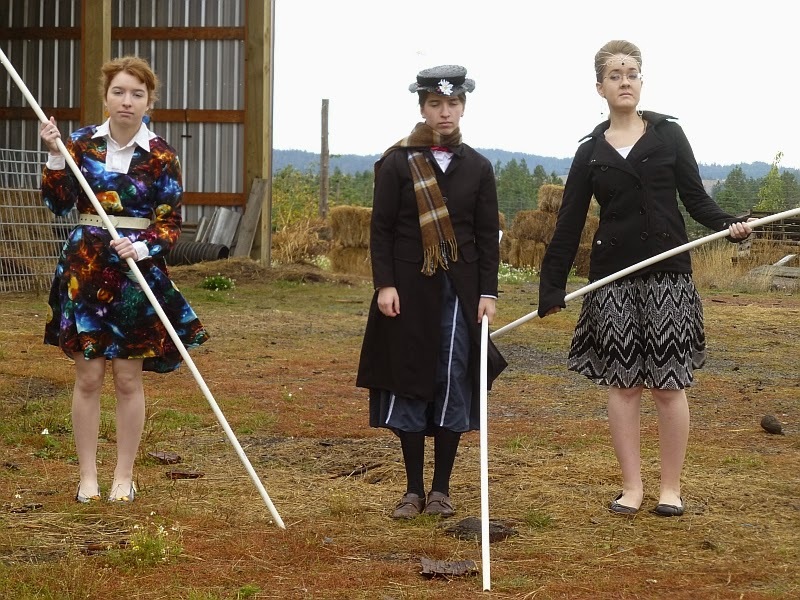 For the last few weeks, the girls have been busy putting together costumes to attend Pac Con (described on the website as "the region's largest Pop Culture and Comic Convention attracting fans of TV, film, comics, anime, animation, art and collectables and costuming from around the region"). 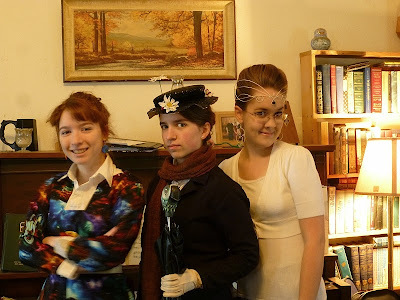 My nerdy girls wanted to "cosplay" as time travelers (à la Doctor Who), specifically Mary Poppins and Ms. Frizzle (from the Magic Schoolbus). The costumes required either clever finds at thrift stores, or sewing from scratch. Here's a cut-down straw hat with flowers and grapes (couldn't find cherries) to imitate Mary Poppins' chapeau. Younger Daughter made Older Daughter's Ms. Frizzle dress from a gaudy cotton print with a planet and space theme. Older Daughter couldn't find any screaming-yellow thrift store pumps like Ms. Frizzle wears, so she settled on patent leather flats and attached some space and school bus stickers. Here they're clamped on so the glue will dry. GG, our resident jeweler, made Older Daughter a hasty pair of planetary earrings. Friday night she also braided Older Daughter's damp hair into multiple silly braids in order to "frizz" it the sufficient amount for the big day on Saturday. Don made Younger Daughter a wooden parrot head to fit on the end of an umbrella. Here Younger Daughter is painting it. She also constructed a carpet bag out of cardboard with a tweed fabric covering (not exactly matching Mary Poppins' bag, but the best we could do). She added a last-minute cloth handle in the car while I drove to the event. ...with accompanying earrings. It was fascinating to watch the creation process and I plan to do a blog post on how she makes things in the future. 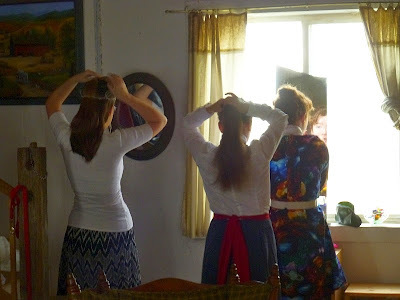 Here all three girls primp, getting ready to leave on Saturday morning. The girls pose just before leaving for the event. But before we left, we had to all join forces and scoot a recalcitrant calf back where she was supposed to be. Little Lucy has become quite the escape artist. This is my grumpy group after chasing a calf. Hey, life on a farm. They certainly weren't the only ones in costume! Older Daughter took a few photos from inside the convention. 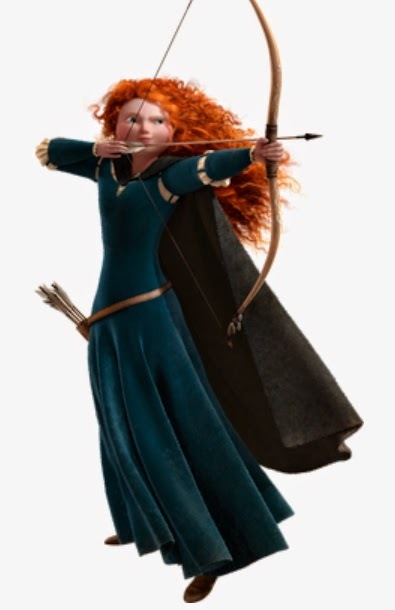 Princess Merida from the Disney movie Brave. Just some guy in a costume Older Daughter admired. But the big draw -- and I specifically asked for photos, if possible -- was William Shatner, the original Captain Kirk of Star Trek fame. Among the nerd crowds, there is some disdain for ol' Mr. Shatner (beautifully spoofed, of course, in the movie Galaxy Quest), but having grown up on the original television series, I have an abiding affection for him. Therefore I was absurdly pleased when the girls said his talk was packed and he had several hundred people lining up for autographs at something like $80/pop. Hey, a guy's gotta make a living. Here the girls paid a small fee to have their photos taken in front of a life-size TARDIS from Doctor Who. All in all, the kids had a terrific time in this nerdy atmosphere and chattered about it for hours. As Younger Daughter summarized, "As far as nerds go, it's nice to know we're not alone." Not only are they not alone, the nerds make the big bucks these days. Darling costumes! What a fun adventure for the girls. Thanks for sharing. Aw man! I didn't know they had a TARDIS there! I would have made more of an effort to go...awesome costumes for the girls, though! Great costumes - so glad you let us see how they evolved. Love it when the costume is made, not purchased. I think the calf chase is my favorite shot. That's priceless. There's the beginning of a story there, which opens with three interesting and very different characters suddenly find themselves touching down on an Idaho cattle ranch, where their first task is to quickly save a young calf from predators....or something! Thank you for including us, Patrice and sweet girls. Great jobs on the costumes. Much fun. My favorite, too. I nearly snorted coffee out my nose. So glad you got that photo. Great stuff to start the day. Oh man, cannot believe we missed this. :( Bummer. I've always stressed the fun and creative challenge of making our own costumes. I figured our dress up days would be over with once they hit teen years. Not a chance - my 14 & 16 year olds have more costumes than my 2 & 6 year olds! My eldest is working up a Jareth the Goblin King (from Labyrinth) costume right now. So much good, clean and constructive fun for teens/young adults! My older granddaughter went to an American history course/camp at a college this summer. That was referred to by the attendees as "Nerd Camp". What fun! It was such a surprise this morning to see you were at Pac Con because we were there too! We also went to see William Shatner speak, but were on the other side of the room from you. What a fun little coincidence! I'm sure we would have recognized you if we saw you, although you wouldn't have had a clue who we were haha! I guess that shows how large the convention was. 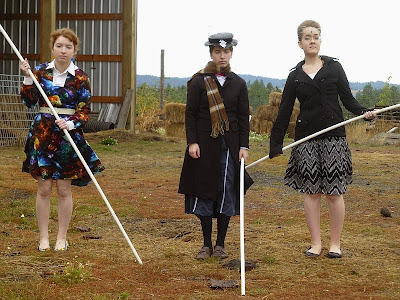 Just to clarity -- the girls were there, I wasn't. I hung around coffee shops for the day until they had seen everything and gave me a call to pick them up. What pattern did you use to make the dress? Younger Daughter made her sister's dress, and she said she didn't use a pattern -- she just "winged it." Whoa!! That's impressive! How did she make the sleeves so wonderfully puffy?